2016 Reunion, June 17-22, Newport, KY, Reunion/picnic June 18, details to follow shortly. Jan has 20 rooms blocked at the Comfort Inn (5 blocks from James Taylor IV mansion) for June 17-22, 2016. Rooms are River View for $159 per night. You can book from now until May 1st. Breakfast is included. Room has microwave & mini fridge. There is now a private area of the website for Members Only. See it under the Membership & Application tab. An explanation of how it works and partial instructions are there. It requires an account at wordpress (which hosts this website for free) & the account is free. There are 3 members who have access as of 11 Jul 2015 and I have not sent out invitations to join yet (you don’t have to wait for my invitation to join if you want to play on your computer and beat me to it). I have set up a private Taylor Association Tree at ancestry.com which has a link in the Members Only area. If you want your genealogy to your grandparents to be connected send an email request to me. I will only add first & last names and no dates or places. Your grandparents are in my genealogy research already & are on the public Taylor Association tree at ancestry.com. This will give you the opportunity to see exactly how you are connected to other member cousins. YOUR NAME & THE ADDITIONAL GENEALOGY WILL ONLY BE ADDED TO THE TREE IF YOU REQUEST IT VIA AN EMAIL TO ME. THE PRIVATE TREE IS ONLY AVAILABLE TO MEMBERS WHO HAVE ASKED ME TO ADD THEIR CONNECTING GENEALOGY. After I have added you to the private tree I will send you an invitation to view it. The invitation will ask you to join the free ancestry.com. This only requires an email address & a password. If you already have a paid subscription to ancestry.com then I just need your user name to link you to the private tree. 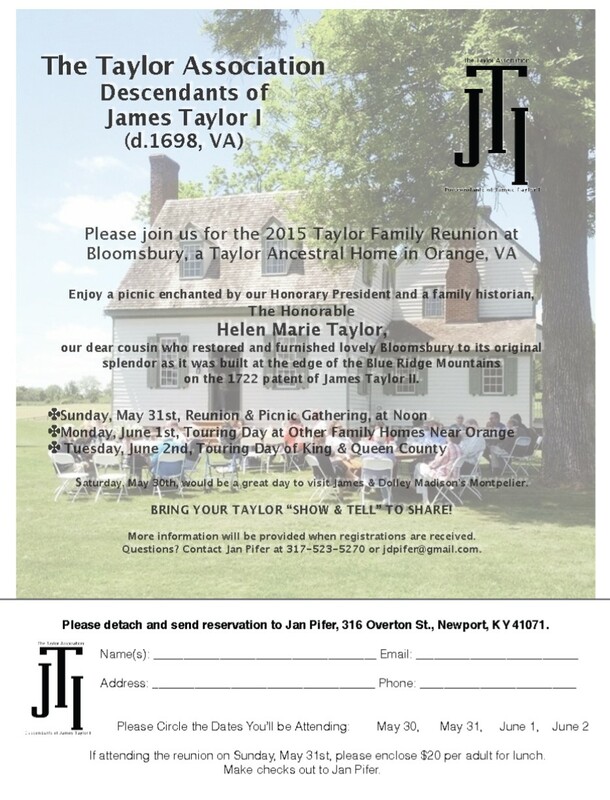 The Taylor Association meeting/reunion 2015 will be held 31 May (Sunday) at Bloomsbury in Orange, VA. For a map to Bloomsbury see the Taylor Places–Orange, VA, Area tab above (zoom in to the far right group of balloons–Hwy 20 (Constitution), Bloomsbury Rd. (beside the airport), at the end of the road. SEE THE TABS FOR PROF./COL. PETER P. MULLEN’S SPEAKING ENGAGEMENTS. 13 Aug 2014–Over 2200 Taylor Association introductory letters/membership application forms were sent to descendants of James Taylor I. All of those who return the completed forms will have the opportunity to become members at the first Taylor Association meeting/reunion scheduled for next June in Orange, VA. We will post the meeting/reunion date as soon as it is confirmed both on this site & on the Taylor Association Facebook site. 18 Aug 2014–12 completed membership applications have been received. 5 Sep 2014–30 more completed membership applications have been received.